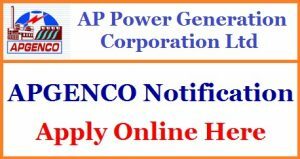 APGENCO Junior Accounts Officer Recruitment Notification released on 13th Nov 2017. As per the Notification details, there are of total 51 vacancies in JAO, Junior Assistants Posts. Aspirants who are eligible need to apply for respective Posts in Online by opening site apgenco.cgg.gov.in before the last date 02nd December 2017. APGENCO Junior Assistant Recruitment 2017: Aspirants who are searching for the Andhra Pradesh GENCO JAO are in the right place. The Officials inviting Online Applications for both the posts of JAO, Junior Assistant posts of total 51 in Number. As this APGENO Recruitment 2017 was released after various time a number of aspirants are going to interest towards this. And the aspirants need to check the qualifications enlisted below to apply soon. Contenders who are searching for Andhra Pradesh Govt Jobs, this is a golden opportunity. Scroll down to know more details about this. APGENCO Junior Assistant Jobs Recruitment provided the complete job information including the vacancies along with Educational credentials and Age Criteria. Among the 51 Vacancies, JAAO Contains 26 posts and 22 contains Junior Assistant along with 4 backlog posts. So, aspirants as per the post qualifications should know about the applying process and should have to submit in Online Mode. The link to both has been enlisted below. As per the selection procedure, the candidates applied will be tested. We also provide the Syllabus in addition to this notification to get qualified for the upcoming recruitment rounds. And the Exam Also scheduled to be conducted on 30th December 2017. As per the APGENCO Junior Accounts Officer Recruitment 2017, Aspirants who are applying should Possess as on 1st October 2017. Trainee Junior Accounts Officer (JAO): First Class in B.Com/M.Com and passes certificate in IPCC/Intermediate along with ICA/Cost Accounts Of India. Junior Assistant: Must Hold Graduate Degree in BAA/B.Com/B.Sc from the recognised university of India. Along with this, he should pass Diploma in Computer Applications. However, the SC/ST/PWD candidate possess the age relaxation as follows. General/OBC Category: Rs.500/-( Rs.350/- For Examination Fee and Rs.150/- for Registration Fee). On Homepage, aspirants need to find the APGENCO Junior Accounts Officer Recruitment 2017 Notification link and open it. Andhra Pradesh Power Generation Corporation has placed the Post Wise Details along with region wise details here. First, the aspirants need to apply for the APGENCO JAO Recruitment 2017 by paying the Fee first specified as per category. As per the guidelines, the recruitment will be done for the applied aspirants. For that, Applied Aspirants have to qualify for the Four rounds of selection with a high score. While Selecting 80% of Jobs priority will be for Local Aspirants and 20% based on Merit For Other non-local candidates. As per the APGENCO Notification 2017, aspirants need to apply for only one post. Officials won’t accept the applications if more than one application is received. So, candidates those who want a govt job should apply for this APGENCO by paying the fee before the due date 02-11-2017. We soon upload the Admit Card link to attend the test. So, utilise this better chance to settle in this APGENCO Organisation.